It’s not often that we stop into a church, only to discover Moorish architecture and a muezzin calling us to morning prayers. However, it could happen this weekend. 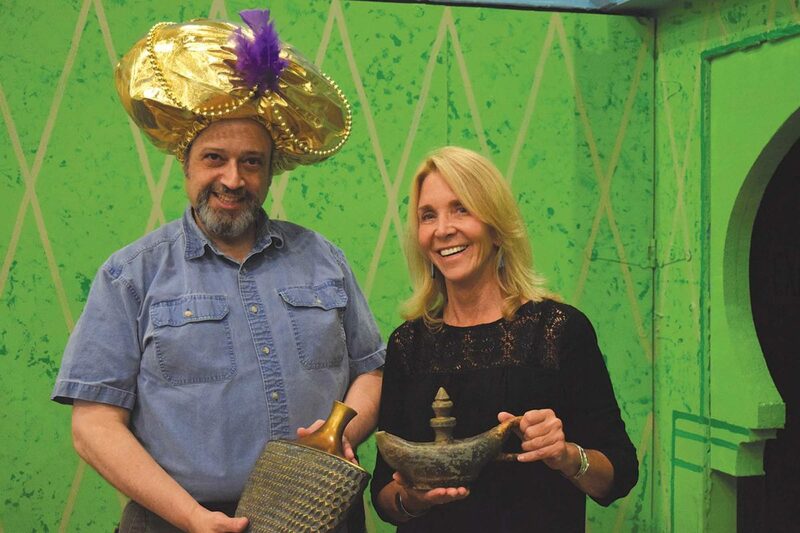 That’s when “Kismet” opens at the Manhattan Beach Community Church Theatre. And so, once inside, you may look around and wonder: “Where am I?” Well, Toto, we’re not in the South Bay anymore. 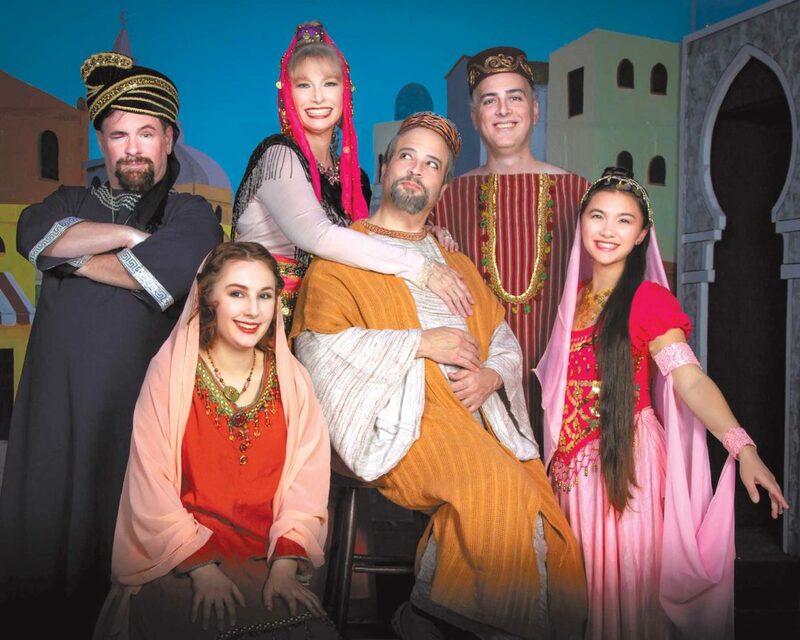 “This is 1071, during the golden age of Islam,” says the show’s director, Steve Norris, “where there’s medicine and scientific stuff going on, there’s all this art going on, and it’s just this tremendous time and Baghdad is the crossroads for everything. It is the religious and political capital of the whole area. “And from that,” he continues, “is where I built the story, trying to embrace the Islamic view and to show that Baghdad was a beautiful city like other cities in the Middle East that are now, if you look at the evening news, completely destroyed and have lost their former glory and been stripped of their artwork. I want people to remember that. These are beautiful places with a beautiful culture,” and a culture dating back thousands of years but so violently marred by the violence and fighting of past decades. In short, Norris concludes, he wants us to imagine an Arabian Nights story from an enchanted and magical era of long ago. “And that’s why they’re not going to leave during intermission,” interjects Karen Hill. Hill is the production’s hair and makeup guru, while Manning has the envious role of the slave merchant. He’s also the front half of the show’s camel, while Devon Darley brings up the rear. To continue, we have a street beggar, a kind of rhymin’ Simon who soon becomes known as Hajj, who’s simply trying to make ends meet for himself and his daughter, Marsinah. That’s one through-line. Another involves the efforts of the Wazir, the chief of police, to find a wife for the young Caliph, which is to say the Prince of Baghdad. The Wazir, naturally, is seeking a woman of wealth and royal blood, but meanwhile the Caliph, wandering through the palace grounds, encounters a lovely maiden who happens to be Marsinah. The Caliph, it turns out, is love-struck and wants to marry Marsinah (their chance meeting has given us the always reliable showstopper, “Stranger in Paradise”), but she vanishes and he searches for her in vain. In real life, as many of us know only too well, our Marsinah is gone forever, but in musicals the odds of a reunification are so much better. Kismet is also what allows Hajj to move up the ranks (kind of like J. Pierrepont Finch in “How to Succeed in Business Without Really Trying”). Helped along by his wits and his daring, despite a résumé that includes thievery, Hajj weasels out of dire predicaments and by assisting the unsavory Wazir hopes to be anointed Emir, which in the scheme of things, as Norris points out, “is right underneath the Wazir, which is right under the Caliph.” Not realizing it, Hajj is actually working at cross-purposes to that of his daughter’s and the Caliph’s happiness, but presumably the threads will untangle. Or maybe they won’t. You’ll just need to find out for yourself. “Kismet” wasn’t always a musical. It began as a play by Edward Knoblock, written in 1911. Various movies, many of them silent, emerged from the late teens through the 1920s and beyond. Eventually, Charles Lederer and Luther Davis came along and adapted Knoblock’s play, to which were grafted and integrated music and lyrics by Robert Wright and George Forrest, with most of the musical themes based on compositions by the Russian composer Alexander Borodin (1833-1887). “The writers of ‘Kismet’ had just come off another show that they were very successful with,” Norris says. “They tried to elevate musical theater to a more classical level, a more operatic level, to upgrade the American musical and give it more ‘class.’ So they wrote ‘The Song of Norway’ and used the music of (Edvard) Grieg.” In the early 1950s, when the radio and the phonograph were the kings of home entertainment, families could turn the dial or drop the needle and hear Mario Lanza and other crooners singing these songs with melodies they were perhaps already familiar with. Which it does, clearly, invigorating the entire genre because there’s room enough for all manner of style and approach. While some shows staged in the church theater have a run of three weekends (“Company,” for instance), “Kismet” is just in town for two, and one of the reasons is that the lush score is being performed live by a 28-piece orchestra, conducted by Joe Derthick. Another reason, according to Bailer-Alfvin, is that of scheduling conflicts, especially around major holidays like Easter. 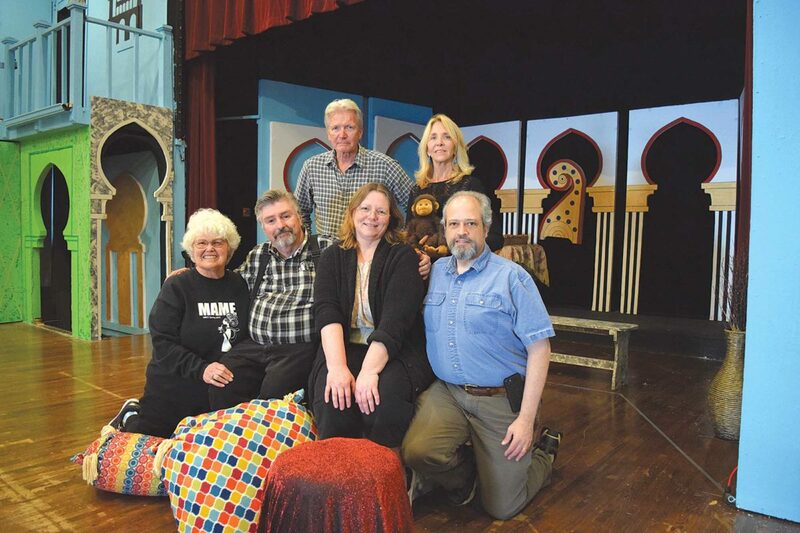 It should be noted that, more like professional rather than the typical amateur theater company, this group usually rehearses for about 11 weeks. That’s not to say you’ll be as dazzled as you were by “Wicked!” or “Dear Evan Hansen,” because those actors majored in the dramatic arts and are doing it full time, but the shows in general hold their own, and then some. The sets this time out were constructed by Dale Townsend, with designing input from director Steve Norris. Steve’s wife, Susan, is the show’s producer and apparently a wizard with the sewing needle. She’s assembled costumes for many of the plays and musicals (e.g. “The Music Man”) for many of the company’s productions. “I like what Steve is doing at the very beginning of the play, at the mosque,” Hill says. Is the stage calling you? This is one theater company where we’ll see many of the same actors from one show to the next, so they’re always excited when they can draw in fresh faces and new talent. Bailer-Alfvin mentions Liana Wopschall (“She’s a beautiful opera singer”), who plays Marsinah, the Poet’s daughter and the Caliph’s love interest (the Poet played by Bob Minnichelli and the Caliph by Michael Thorpe). Lalume is the manipulative wife of the Wazir (Mark Eggert), a role ripe with possibilities. It’s at this point that we’re joined by the Poet himself, Bob Minnichelli. As Hajj the beggar he bears some similarity to Lalume in that he finds himself able to work the tables to his advantage. Of course the bigger question is, how did he land such a plum role? “I have no idea,” he replies, but it turns out he’s only waiting for Steve Norris to give a full accounting of the circumstances. “We have tryouts for the role, and we had a couple of people, (but) they weren’t right. And we were getting down to the wire. Sounds like one of those backroom deals where everyone’s smoking cigars and then, with a handshake, it’s a “go” for all involved. While Minnichelli does seem perfect for the part, this writer mentions that if he forgets some of his lines he can always reprise a few from “Fiddler on the Roof.” Minnichelli demurs, slightly, but the others have a good laugh.